Heat a tea spoon of oil in a pan. Add rai, jeera, chana dal, urad dal curry leaves. Fry until the chana dal changes to golden color. Add green chillies and red chillies. Saute and remove the ingredients into a bowl and allow to cool. In the same pan add a table spoon of oil. 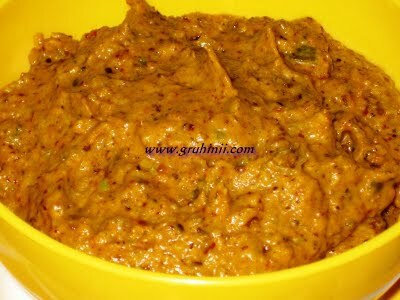 Add the chopped kunduru pieces and cook in a medium flame. When the kunduru pieces are cooked well, switch off the flame and allow to cool. Grind the dals, and chillies first. Then add the kunduru pieces, tamarind, salt, sugar and garlic pods. Grind coarsely and take the chutney into a bowl. Heat a tea spoon of oil in a pan. To it add half tea spoon rai and curry leaves. When rai starts spluttering, switch of the flame and add the thadka to the chutney.